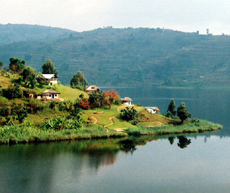 ...is a traveler's paradise located at Lake Bunyonyi in the southwest of Uganda. Situated on a peninsula alongside a protected cove at the heart of the stunning and serene island-studded lake, we cater to independent and budget travelers looking for serious relaxation, gorgeous views, unique accommodations and delicious food, all at the most affordable prices in the region. While tranquility and relaxation in a beautiful island setting is our main attraction, there is also plenty to do... from island-hopping by canoe, to trekking through the hills and villages around the lake, to birdwatching the 150+ species found here, or visiting various scenic and cultural hotspots of the area - either guided or unguided, or just swimming and hiking at the island itself... you will not be at a loss for a pleasurable activity when you are ready. Take the advice of fellow travelers you meet who have already stayed with us and come experience Byoona Amagara for yourself. ...is a sustainable development initiative that bridges the gap between tourism, education, agriculture and healthcare, in a location where all are essential to daily life. Our services in tourism provide the primary source of funds for the projects we run in the community, which consist of various elements in rural education, "livelihood level" organic agriculture, healthcare maintenance, diagnosis, treatment and prevention at the village level, as well as micro-financing and entrepreneurial grants in tourism, renewable energy, and more. While we do not actively solicit donations either locally or from abroad, we do certainly welcome them. 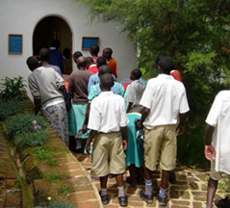 Byoona Amagara is a not-for-profit organization dedicated to supporting education and sustainable community development at Lake Bunyonyi. 100% of our proceeds go to support local programs in education & literacy, organic agriculture & indigenous forestry, cross-cultural exchange, and more... including the development of our new library & multimedia center at Itambira Island. 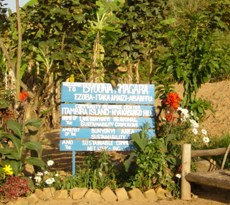 All programs conducted at Byoona Amagara are based upon advancing development sustainably in the local community. Beyond some of the program areas mentioned above, we also maintain various initiatives in ICT technology & training, permaculture & ecology, tourism & finance, et al. If you have any questions or comments, or are interested in sponsoring the education of local children at either the primary or secondary level, please contact us.